Last Updated: October 3, 2018 | Subscribe to our weekly newsletter! You wake up one morning and your pool has gone from crystal clear to green and cloudy. Maybe someone forgot to wash their swimsuit or you let your pool chemistry slip while you were on vacation. It happens to the best of us, don’t worry. Whatever the cause, you now have to rid your pool of algae. No problem, you might think. I’ll just get an algaecide. But before you reach for this particular pool chemical, ask yourself: Is algaecide really the best way to get rid of algae? Despite the name, the answer is, probably not. It may surprise you to learn that algaecide isn’t a magic bullet for getting rid of algae in your pool. In fact, algaecide is more effective as a preventive measure than a treatment. Don’t get us wrong—it still helps as an algae treatment, just not in the way you might think. Many algaecides are copper-based—either made of copper sulfate or copper chelates, which are chemical compounds with a metal as the central atom. A few registered algaecides instead use the herbicide endothall or sodium carbonate peroxyhydrate. These chemicals all disrupt algae’s regular cellular processes, although research hasn’t really explained exactly how they accomplish that. It may be they disrupt energy transport or algae cell division, or maybe they inhibit the synthesis of new cell proteins, which are crucial for cell survival. Essentially, we know algaecides work—to some degree—but the reason why they work is still unclear. It’s important to note that if you live in an area that has high metal content, and you’ve filled your pool with that water, you could be risking oxidation which can stain your pool. Adding even more copper in the form of algaecide can speed this process. If that’s the case, look for a copper-free algaecide If you click this link and make a purchase, we earn a commission at no additional cost to you. to help protect your pool surfaces. Out of the tens of thousands of varieties of algae in the world, we only deal with a handful. Sure, they’re a pain, but it’s not like we’re handling anything crazy like “red tide,” which is extremely toxic to both animals and humans, or the delightfully named “rock snot” (Google it—we dare you.). But the lack of variety really is lucky for us, since it makes the algae we do see easier to prevent, identify, and treat. Green algae: By far, the most common, especially if you forget to wash your swimsuit after a dip in a lake. Yellow or mustard algae: Much rarer, but it’s a persistent and particularly annoying uninvited pool guest. Black algae: The toughest type of algae to get rid of. Pink algae or pink slime: Technically bacteria, but is often mistaken for algae thanks to its slimy appearance. So here’s the main thing you need to know about pool algae. Chlorine—yep, your typical sanitizer—is much more effective at killing algae If you click this link and make a purchase, we earn a commission at no additional cost to you. than algaecide is. Even if your water gets cloudy and your walls get slimy, chlorine can still kill it. That’s because chlorine oxidizes bacteria and single-celled algae, which means they trade electrons. It doesn’t sound like much, but this trade of miniscule particles has a huge effect on algae cells. The oxidized cell walls rupture, which causes the loss of vital nutrients, and halts both growth and replication processes. So as long as you maintain your pool chemistry—that means 3 parts per million (ppm) for chlorine, 3 ppm to 5 ppm for bromine If you click this link and make a purchase, we earn a commission at no additional cost to you. , or 30 ppm to 50 ppm for biguanide, in addition to balanced pH levels—you shouldn’t have to worry about algae growth. If your pool gets infected by an outside source, shocking your water like it’s your full-time job between intense scrub-downs will usually get rid of the problem. Algaecide can help speed this process along, but it’s not entirely necessary to rid your pool of algae. Unless, of course, you’re dealing with chlorine-resistant algae like mustard algae or black algae. This is one of the few times you may need to consider using an algaecide. But even then, it should be used in addition to chlorine or other sanitizers, not instead of them. Regularly checking and maintaining your pool chemistry is the number one way to prevent algae from taking root in your pool. The second-best prevention method is to reduce the chances of outside contaminants invading your pool water. That means if you’ve recently been in the ocean, natural lakes, or natural rivers, you absolutely, positively need to throw your swimsuits in the washing machine for a good cleaning. And if you brought your usual pool toys along, they also need to be sanitized before you put them back in the pool. That means using a bleach solution or bleach-based cleaner to ensure no errant algae is transferred to your pool. If you live near a natural body of water where you regularly swim, it might not hurt to use algaecide in your pool as an additional precautionary measure. If it’s a particularly sunny day—algae loves sunlight—adding a preventive dose in the morning might reduce your risk of an algae bloom. Some algaecide manufacturers list prevention instructions first on their packaging, since it could be an effective use of the product. One time when you really do want to add algaecide to your pool If you click this link and make a purchase, we earn a commission at no additional cost to you. is when you close it. Your pool is going to sit covered and unused, probably for months, and that dark, humid environment is just prime for algae to move in while you’re not looking. Whether you’re closing an inground pool, or winterizing your above ground pool, make sure algaecide is on your list of essential closing supplies. Algae happens, but you usually don’t need an algaecide to get rid of it. Keeping your water chemistry clean and well balanced will prevent growth in most cases, while superchlorination with pool shock If you click this link and make a purchase, we earn a commission at no additional cost to you. can handle minor and common infestations. In fact, algaecides usually require a shock treatment before application anyway. 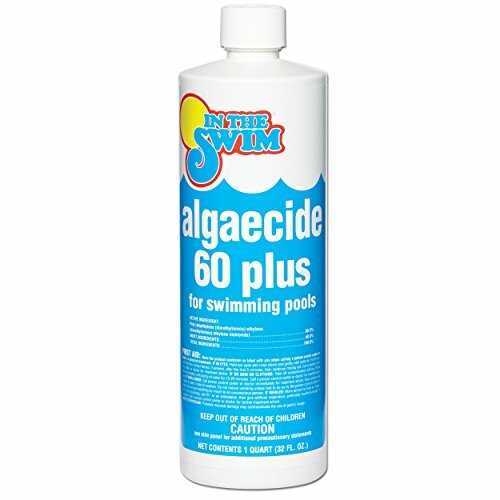 So unless you’re dealing with mustard algae or black algae, leave the algaecide on the shelf and get ready to shock the heck out of your pool. 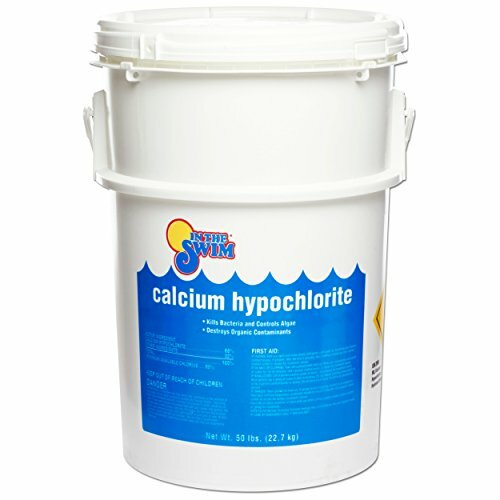 But when dealing with regular ol’ green pool algae, chlorine is your best bet to kill it dead. Got mustard algae? Here's a very simple tutorial that will walk you through how to remove stubborn mustard algae from your swimming pool. 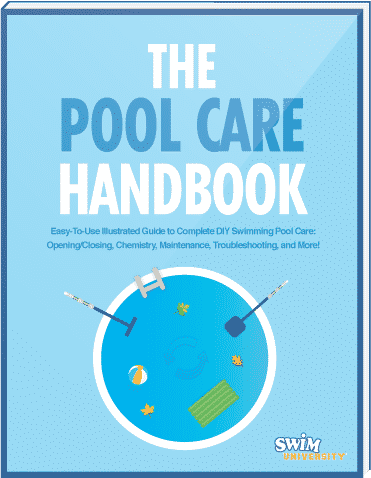 Learn all the steps you need to quickly and easily remove pollen from your pool so your water looks crystal clear and ready for swimming.